Humour can be found in places one least expects it which, I guess, makes it all the funnier. Sometimes it’s there – plain as day; and one doesn’t really need to do much to get it out. And when it IS there, if you try too hard to make it funny, well, you won’t… simple as that. 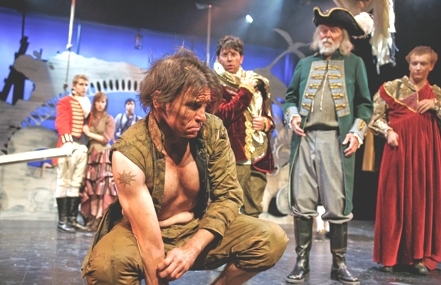 Thankfully, Shakespeare’s The Tempest at U of T’s Hart House has more than enough other elements to make up for this performance’s lack of humour. Poor Caliban being berated by Prospero! It might just be my own acting background coming up, but when someone plays a character as “look at how drunk I am”, they will get more pity out of me than a laugh. Shakespeare has written the humour for us. If the actor knows what they are saying, the audience will too. The duo of Trinculo (Cameron Laurie) and Stephano (Paolo Santalucia) sadly did not meet my expectations with the Bard’s comedic styling. That isn’t to say the entire show wasn’t up to my (apparently) high standards. To the contrary, lighting designer Joseph Patrick completely blew me away with his storm scenes and his creation of Prospero’s (Peter Higginson) magic throughout the play. He created dynamic light shows that melded smoothly with each scene and used the white-washed set pieces to great effect. Throughout, the entire play there was one aspect as written by Shakespeare that was almost omitted. The magic of Prospero is incomplete without the use of Ariel (Amaka Umeh)- the Sprite of the island. Ariel commanded the entire Ensemble of demi-sprite beings that danced and became different parts of the set themselves, coming to life and creating a mystical feeling of wonder that captivated my attention from the moment they appeared on stage. Due to a slight miscommunication and unfortunate circumstances involving 12 missed texts messages and a broken phone, I almost had the misfortune of going to this play alone. Theatre is something that is always for others to enjoy, and sharing that enjoyment makes it all the better. I love asking my companions what their thoughts are on a show, especially if I’m reviewing said show. It makes it all the better when you can crack jokes to each other (respectfully after the show and no one is within earshot, of course). So, dear readers; the next show you attend, no matter where or what it is, – bring someone along. You might just start laughing up a storm.